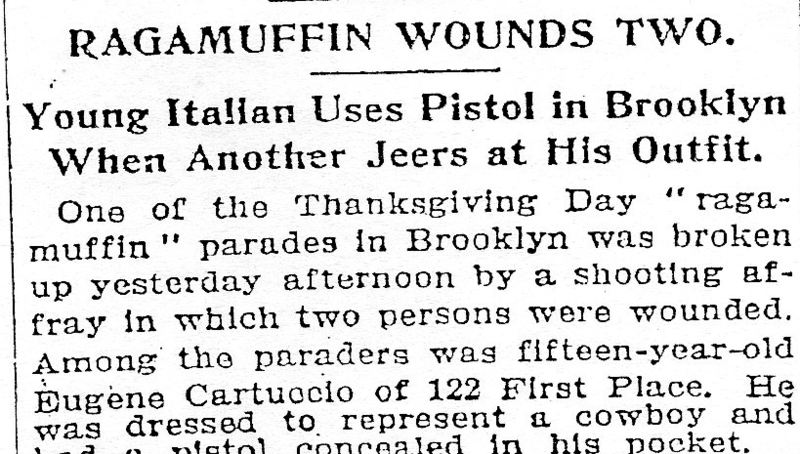 So read the headline of the New York Times on November 27, 1914. But the article isn’t referring to hungry poor people looking for a handout. As this second article, published in the Times in 1907, makes clear, the ragamuffins were regarded as quite a nuisance. Some neighborhoods scheduled loosely organized ragamuffin parades (Bay Ridge still has one; it’s held earlier in the fall), but it appears that most of the time, kids were on their own. They went out in groups—asking for pennies, playing practical jokes, and of course, getting into fights. The ragamuffin tradition supposedly came from Europe, where it was customary to symbolically beg on holidays. I don’t know if this is true, but it seems that at some point begging on Thanksgiving turned into trick or treating on Halloween. 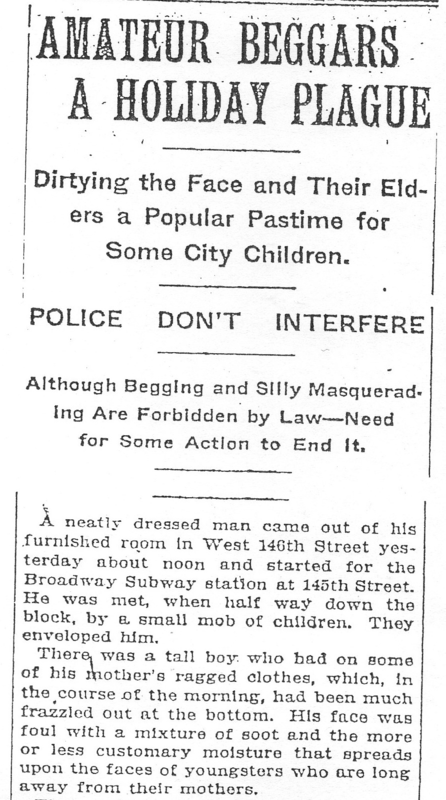 And another strange old New York custom was lost to the ages. This entry was posted on November 27, 2008 at 7:01 am and is filed under Holiday traditions. You can follow any responses to this entry through the RSS 2.0 feed. You can leave a response, or trackback from your own site. My mom, who grew up in Queens in the ’30s, used to tell me about this weird tradition, replete with the sing-song refrain (“AN-y-THING-for-Thanks-GIV-in'”) and it seemed rather surreal to me. It’s interesting to read about its origins–and to see that she wasn’t making this up! This is fabulously well-written, incisive stuff. I enjoy your blog every single day. Many things I know about, but many I do not, and it all just helps me weave another strand in the warm blanket of Gotham lore in which I cloak myself so well. It seems we were separated at birth, lol. Get in touch if you’d like to further the acquaintance and share stuff outside of the blogosphere. My Dad who was born in 1929 in Brooklyn told me recently about this unusual custom. I must say, I thought he must have been mistaken…maybe a little senility creeping in! Glad to see he wasn’t confused at all. I feel like I heard of this in St. Louis, too, when I was a little, tiny child. No idea where I would’ve heard it, though. My wife and I live in Bay Ridge now and had been puzzled by the Ragamuffin Parade thing. Thanks for clearing that up. Nice blog, by the way. I enjoy it. Thank you. I didn’t know the ragamuffin-Thanksgiving thing happened in other cities. Too bad strange little traditions like these die out. Ya gotta love a headline with the word “ragamuffin” in it. Love your blog and love the article. Just for your interest, I wrote an item for the Gowanus Lounge under “Urban Environmentalist NYC” the day before (November 26, 2008) on the very same thing! I guess great minds think alike. I participated in the practice myself as a child and a photo of me in my “ragamuffin” outfit is in the article. I submit a n article on Brooklyn history to GL about every two weeks. Ben Feldman, are you the author of “Butchery on Bond Street”? I met you at the dedication of Dr. Harvey Burdell’s and Emma Cunningham’s monuments at Green-Wood. Very much enjoyed your book. Thank you for writing and including that Gowanus Lounge link–somehow I missed it. The photos and more detailed information are fascinating. You’ve also reminded me that I need to reread A Tree Grows in Brooklyn, because I don’t remember the part about Francie wearing a mask! What a great book. I was born after WWII and in our old neighborhood in Brooklyn which is now called Windsor Terrace we still went around the neighborhood, dressed in costumes, knocking on doors and shouting ‘anything for Thanksgiving?’ When I was a few years older we moved to what is now the Kensington section of Brooklyn (really just a mile or so away-shows you how insulated neighborhoods were) where no-one had heard of the custom. We had to learn to ‘trick or treat’ instead! I was born in 1943 also in North Bergen (Hudson County) NJ, and I remember my friends and I were begging in the “Race Track” neighborhood in the early to mid-50s. Then it stopped and dropped out of my memory, or I blended it into Halloween. This year it popped out again, so I thought I’d google to see if I was right. I’m fascinated by the fact that this was such a localized custom, which must have come from certain immigrant ethnic groups. I am Italian as was my neighborhood, but I don’t believe it’s an Italian custom — probably Central European origin. I HAVE TOLD MY WIFE AND CHILDREN ABOUT BEGGARS DAY AND THEY TOLD ME IT WAS IN MY IMAGINATION. FOR YEARS I HAVE TRIED TO FIND INFORMATION ABOUT IT – ON THANKSGIVING DAY WE DRESSED IN RAGS AND RANG THE DOORBELLS OF OUR NEIGHBORS AND SAID “ANYTHING FOR THANKSGIVING?” THANKS FOR PROVING ME RIGHT. My husband was born in 1943 and grew up in Williamsburg, Brooklyn. When he told me he went door-to-door on Thanksgiving saying “anything for Thanksgiving”, I couldn’t imagine what his grandfather would have said if he was caught! This was in the 1950’s. He also said he never went trick or treating on Halloween – that was mischief day. The most he made was $35 — a fortune when the movies cost $.25. Now I know he was telling the truth! I love stories like these—thanks for writing in! I was born in Bay Ridge in 1940. My older male cousins used to black their faces with burned cork, don their shabbiest clothes, and then go out begging. I could hardly wait to grow and to go out with them, but my mother never let me do so. Do you think NY begging is connected to the English Guy Fawkes Day which is in early November? Do you remember, every autumn, the appearance of Charlotte Russe in paper cups? Born in 1943, I went begging on Prospect Place (now called Bed/Sty) till age 10. Then I moved to Brooklyn Heights and no longer begged. We didn’t dress up, just knocked on apartment doors. I was born in the Flatbush section of Brooklyn in 1946, and every year at Thanksgiving we went door to door in our neighborhood dressed like hobos and asked, “Anything for Thanksgiving”. I remember that when I was really little, I would get confused and excited and sometimes mistakenly said, “Trick or Treat”. I was usually corrected very quickly and harshly by my older sister, who didn’t particularly want me tagging along. It was a very widespread tradition in our section (Marine Park) of Flatbush. Good TImes! I grew up in Park Slope Brooklyn and I remember how much I looked forward to begging on Thanksgiving with my sister. We would start early in the morning and come home at noon with all our money. Mom would be cooking a turkey with all the trimmings and my sister and I were so happy with our new found wealth. The memories of “begging” on Thanksgiving in Flatbush section of Brooklyn in the 1940’s have become so vague I am so grateful to hear others reminisce over the same experiences. I was born in Jersey City, NJ in 1946, and I, too, followed the “Anything for Thanksgiving” tradition in my neighborhood..Gardner Avenue. Our neighborhood was mostly Italian/Irish. A friend of mine from Union City just brought up this tradition, which she also remembers. It was so much fun to read about it here! I grew up in Ozone Park,Queens.I remember going to all the neighbors on the block & begging & saying anything for Thanksgiving. I would come home with some money but mostly fruit & nuts.On Halloween we would chalk & floor bag other kids ‘no trick or treat. I was born in Queens, NY (1947) and during the 1950’s and early 1960’s we practiced ” Anything for Thanksgiving.” We were given money rather than candy. However, our parents told us to only call on relatives and people we knew in the neighborhood. This was in the Astoria area.